One of the most effective and lesser-known tricks that the professional painter uses is called back rolling. Back rolling is the act of using a roller to spread paint across a surface immediately after spraying. Back rolling pushes paint into cracks and wood grain, dramatically improving the finished look of the paint job. 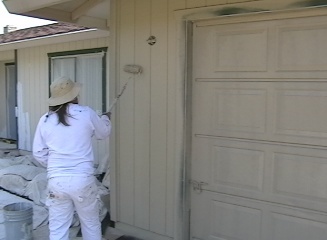 The technique is effective when painting overhangs and exterior walls. When painting stucco, it is absolutely necessary, as the rough texture of the stucco prevents proper coverage by spraying alone. When back rolling stucco, the bigger the nap (thickness of the roller) the better (say 2″ lambs wool roller cover). For backing rolling wooden surfaces, a half or quarter inch nap will suffice. Back rolling is most effective when two people are working together. This ensures that the paint is still wet when it is being rolled. One person sprays, while another back rolls. The primary job of the person back rolling, aside from rolling, is to make sure the person spraying applies a sufficient amount of paint. If you do not have a roller pole and do not want to buy one, try attaching your roller to a push broom pole. I hope this tip was useful and helps you produce a beautiful and professional finish on your home. Normally backrolling is done with the first coat then the second is simply sprayed over top after drying. It is possible to get the required mil thickness with a double spray with backrolling (as you described), this depends on the coating being used and the substrate it is being applied to. Example- Many elastomerics will be applied this way. Normal house paint should have some dry time between coats. Got a contract for 2 coats of exterior timeless paint. I Does about second coat. Painter says he sprays. Then back rolls then sprays. No time lapse between roll and spray. Is the legit? My thought is paint. Wait 4+ hours then do 2nd coat. I’ve painted many interior of homes with textured walls called knock down and smooth. This process forces the paint into the grain and cracks of the wood. Also on interior walls when you touch up a sprayed wall you can see the difference if you did not back rolled it. It’s always best to add a little water to the paint when doing touch up.